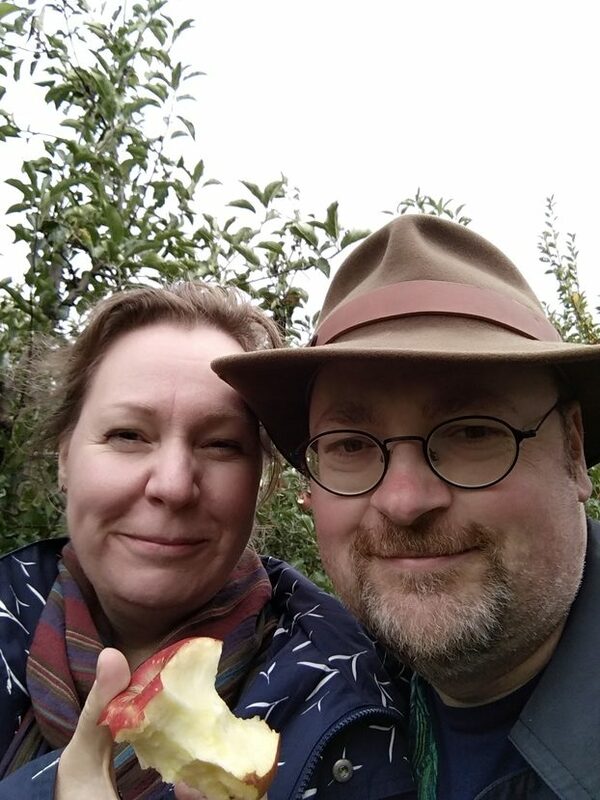 We had our annual apple picking event at a local orchard yesterday! Every Saturday in September, the orchard is open for people to pick their own — and while they sell the apples really cheap, they are even cheaper when you pick them yourself! And of course, apples fresh off the tree are delicious! We were joined by friends B & J and their dog. 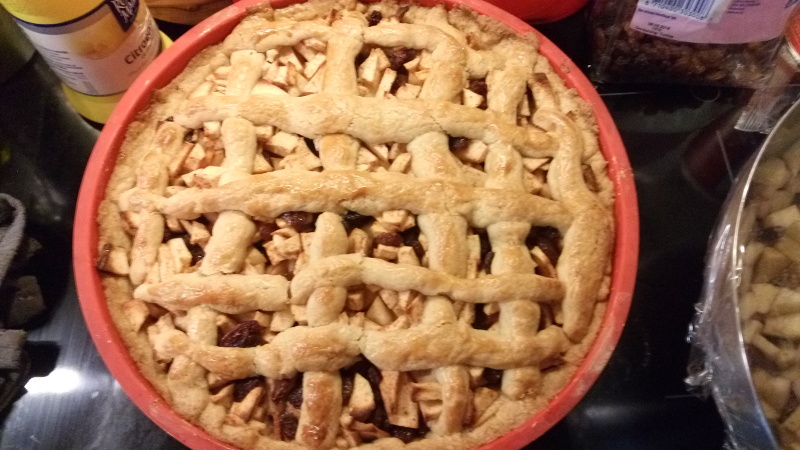 We finished up picking just in time before the rain set in in earnest, and then retired home to start baking apple pie. Dressed for rain, enjoying an apple fresh off the tree. First pie. 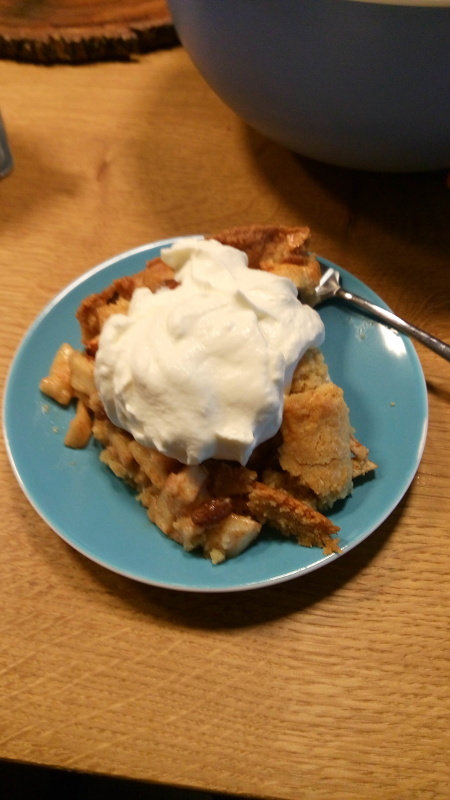 It fell apart after cutting it up, but that didn’t really detract from the taste! Half an hour drive away is the city of Den Bosch. 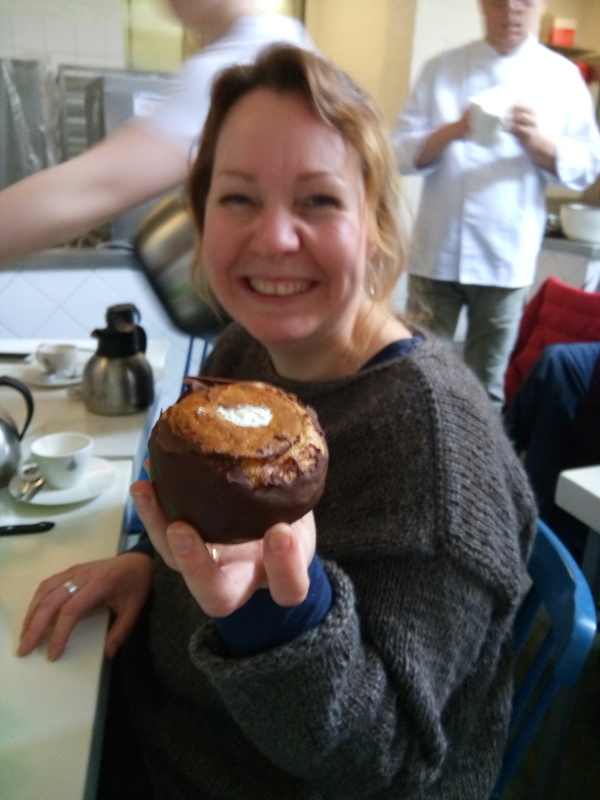 Their regional speciality is Bossche Bollen, a choux filled with heavy whipped cream and coated with chocolate. 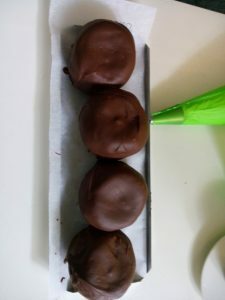 They are also called ‘chocoladebollen’ (‘chocolate balls’) or, phonetically, sjekladebollen. We got discount tickets for a workshop to make these, and yesterday was the day! We met up with babarage, gertvr and xaviar_nl, and after catching up for a bit, it was time for the workshop. Melting the chocolate into the hot syrup. 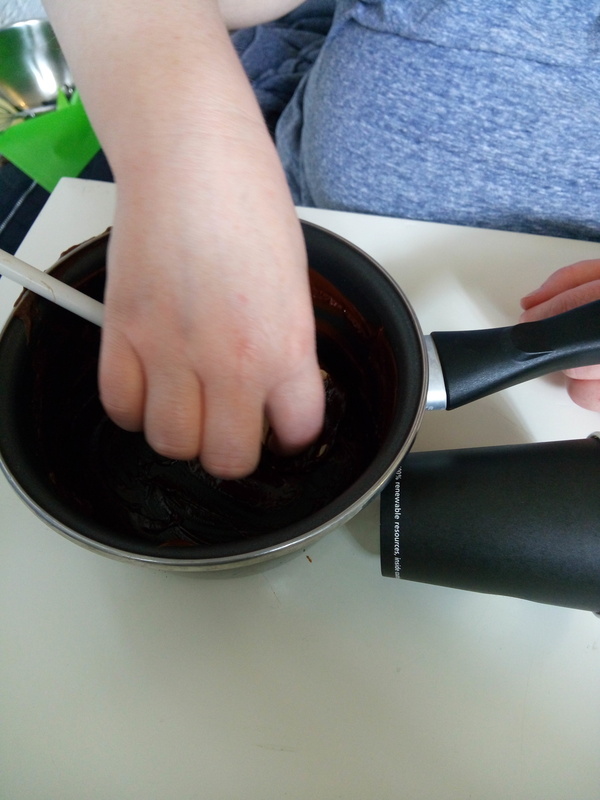 Dipping the choux into the fondant: take the choux by the underside, because that gives you the best grip. 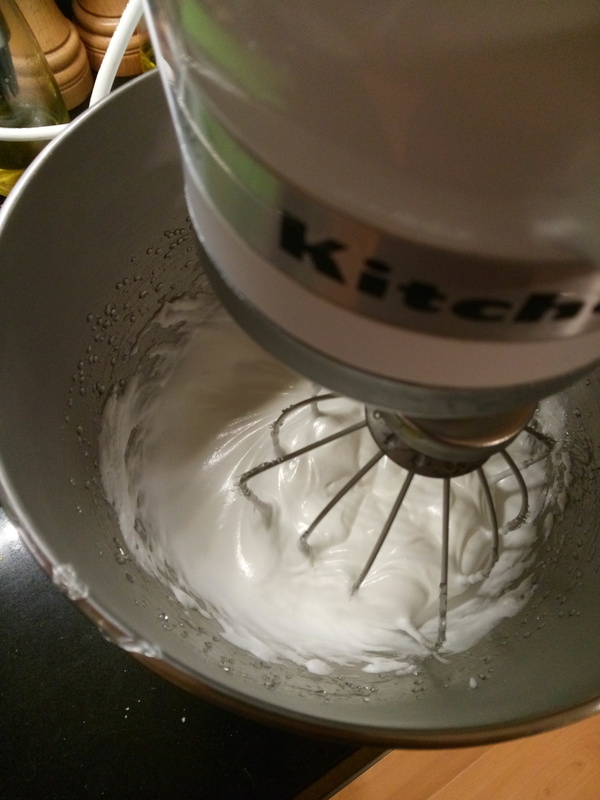 Meanwhile, we whipped the cream (by hand!). 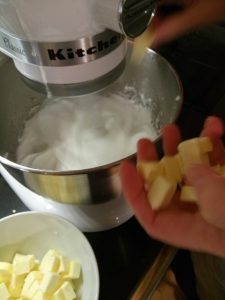 They use 40% fat cream, which makes for a bit of a heavier cream. 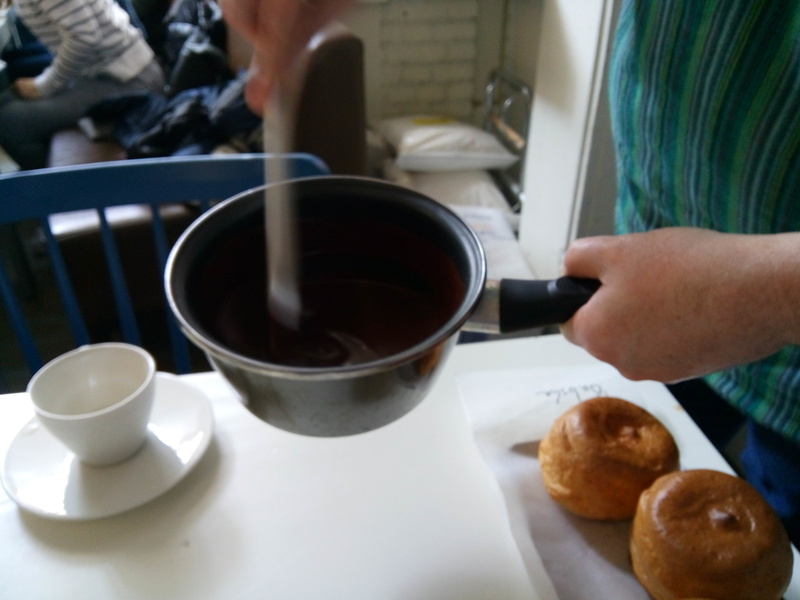 The choux with the chocolate layer, ready to be filled! Done! 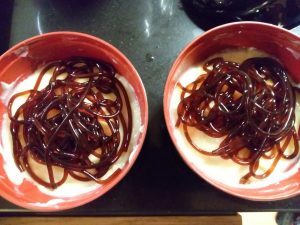 You present them with the chocolate side up, of course, but you eat them upside down, because otherwise every bite would force out the whipped cream down the underside, and that just makes a mess. 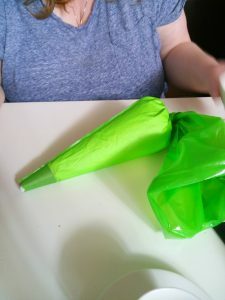 We regularly go to a culinary wholesaler: we got a card from klik’s company, and we regularly get supplies there that are cheaper than at the grocery store, or things that you can’t even get at our regular grocery. The previous time we were there, I saw a molecular gastronomy kit to create ‘pearls’ of foodstuffs using agar-agar, and There are two more of those little kits: one to create foam and one to create ‘spaghetti’. I put it on my Sinterklaas wish-list, because it looks really cool! Ever since, we have been checking out videos from that brand with cool recipe ideas. I didn’t get any of the kits (I’m not complaining: I got lots of good things off my wishlist! ), and today we had occasion to visit the wholesaler again. 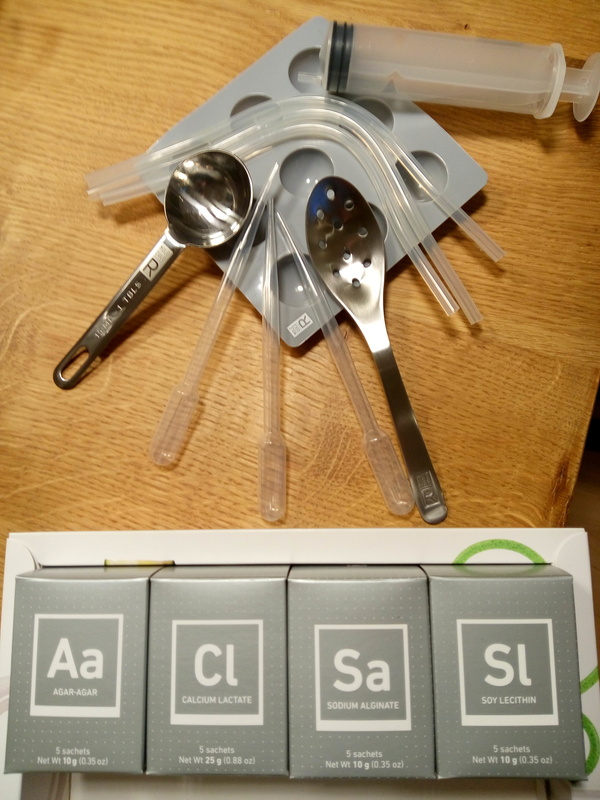 I got the ‘combined kit’ as a gift for myself. 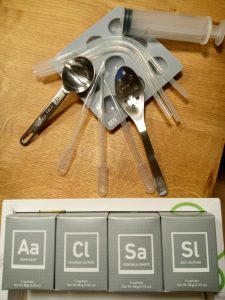 The contents of the kit! 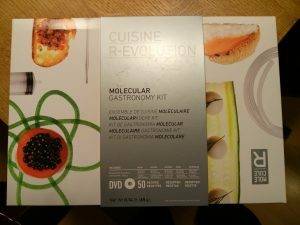 It contains everything to make pearls, spaghetti, foam and for reverse spherification! I really look forward to experimenting with it. 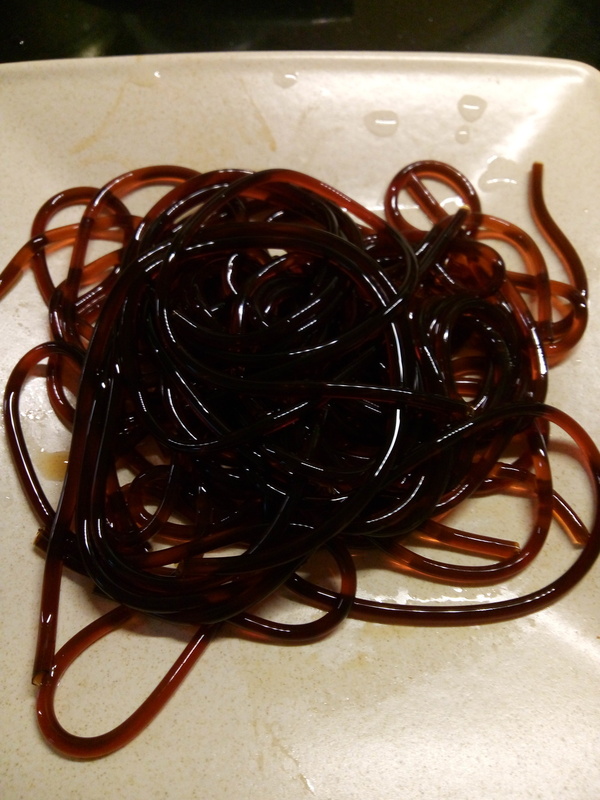 Here’s some videos of the things you can do with it: make honey caviar, or chocolate spaghetti with the agar-agar. 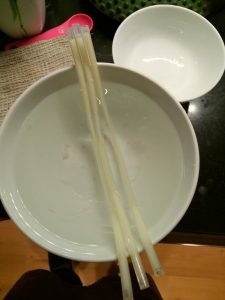 Or make some foam like Curry Wind. 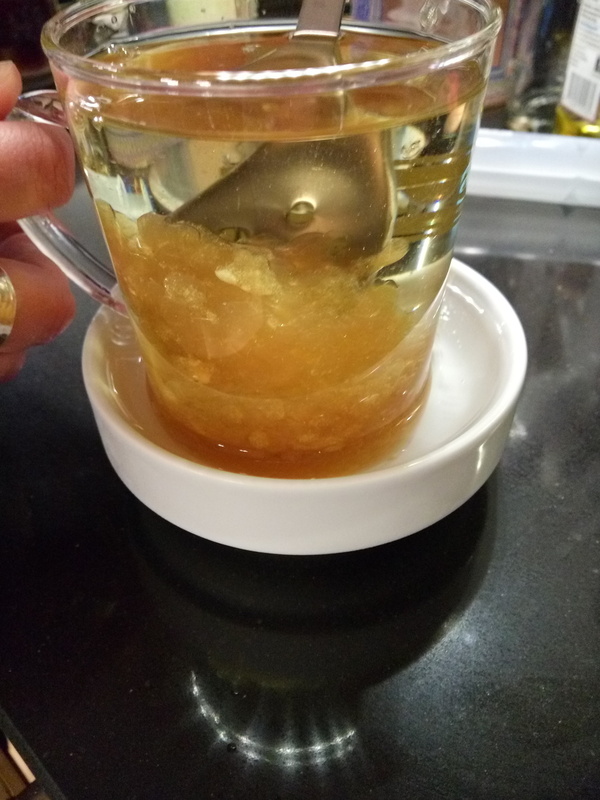 Or combine the gelling of the agar-agar with reverse spherification like with the Coco-almond Fondant! Seven months ago, we released version 5.1 of our software. 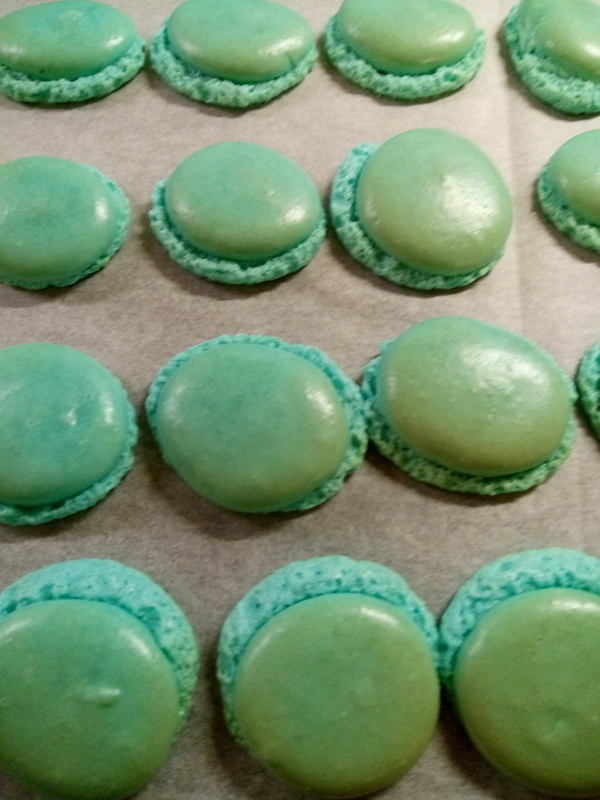 I can’t recall how we came to it, but I ended up treating the team to home-baked macarons. That was so popular that a tradition was born. Monday evening, we released version 5.1.1, so that evening we were very busy baking up two batches of macarons so I could bring them to the office the next day. 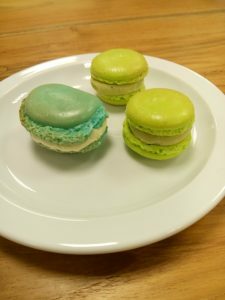 This worked out especially well because two colleagues who have been away on sick leave for a longer time had announced that they would swing by the office for a little while that day — so I could give them the macarons as well! Sift 100 gr of almond flour and 100 gr of icing sugar in a bowl, and add 40 gr of egg white. Mix it all up, and add your colouring. 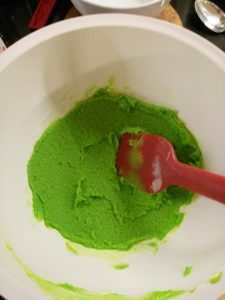 If you have liquid food colouring, don’t add too much, I often do just eight drops, and that’s enough. 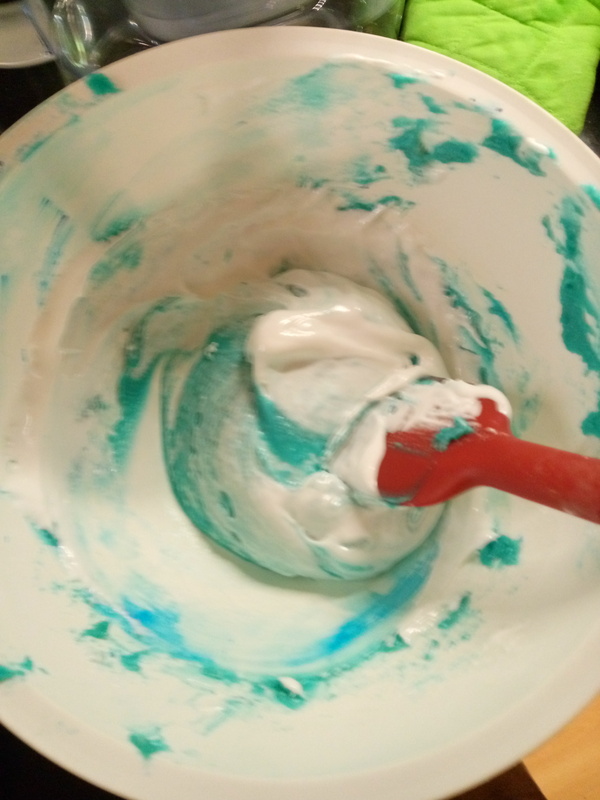 Hundreds of smurfs died for this dough! 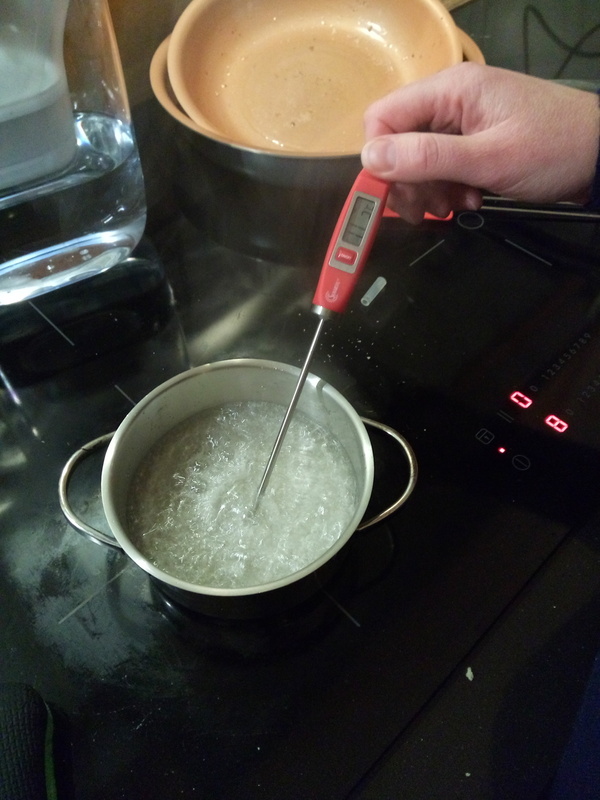 Add 100 gr of (regular) sugar to 37 gr of water, and make a sugar syrup of 118 °C. 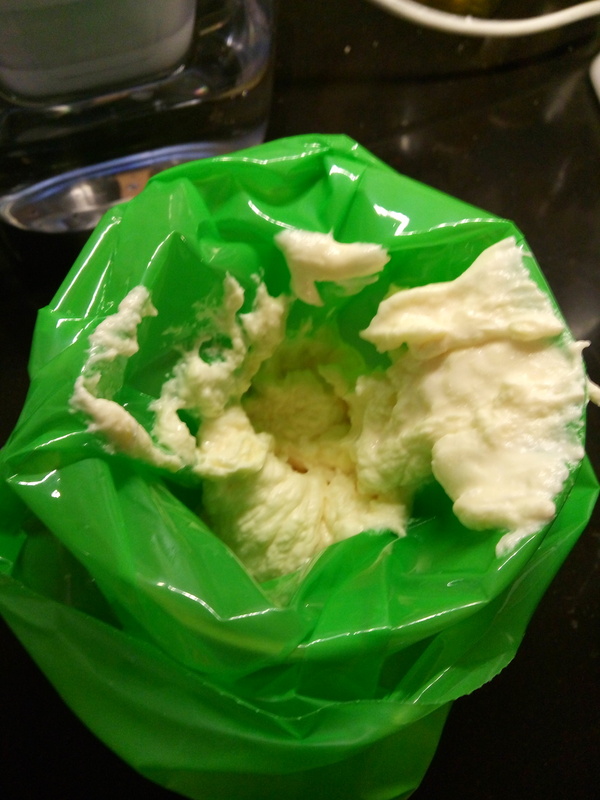 Add it to 40 gr of egg white that you have beaten into a really fluffy mass. Basically, setting 10 on a Kitchenaid for as long as you’re cooking the syrup. Lower the setting of your kitchen machine and add the syrup in a small trickle. 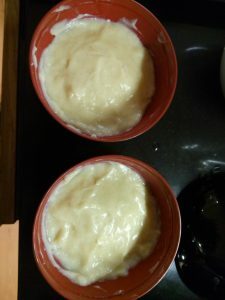 The heat of the syrup will cook the egg whites. Now you gotta add the cooked fluffy egg whites to the almond dough. The way I go about it is to take a big scoop and just mix it through the dough rigorously. 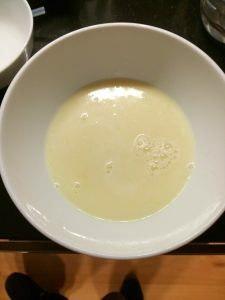 That will break up the egg white a bit, but will make the dough just a tad more fluffy so that it is easier to mix the rest in. 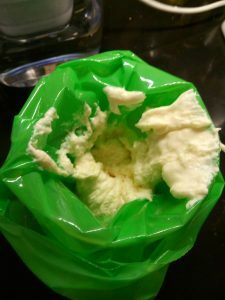 The cooked egg whites will make the colour a bit lighter, but it should be this fluffy consistency. Pipe little rounds of the mixture onto parchment paper. 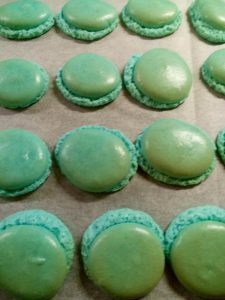 Try to make them roughly the same size, because you need two for a single macaron, and it’s weird if one is large and the other one is small. Leave some room in between, because the mixture will set a bit. Next comes the drying. You want the shells to ‘rise’ when you bake them, and the trick is to let the outside of the shell dry out, so that the egg whites can only expand downwards, yielding the ‘feet’ on the macaron shells. We dry them in the oven at 40 °C for 2×30 minutes. We swap the positions of the two baking trays in the oven, so that they dry out evenly. Then it’s in the middle of the oven on 160 °C for 20 minutes. 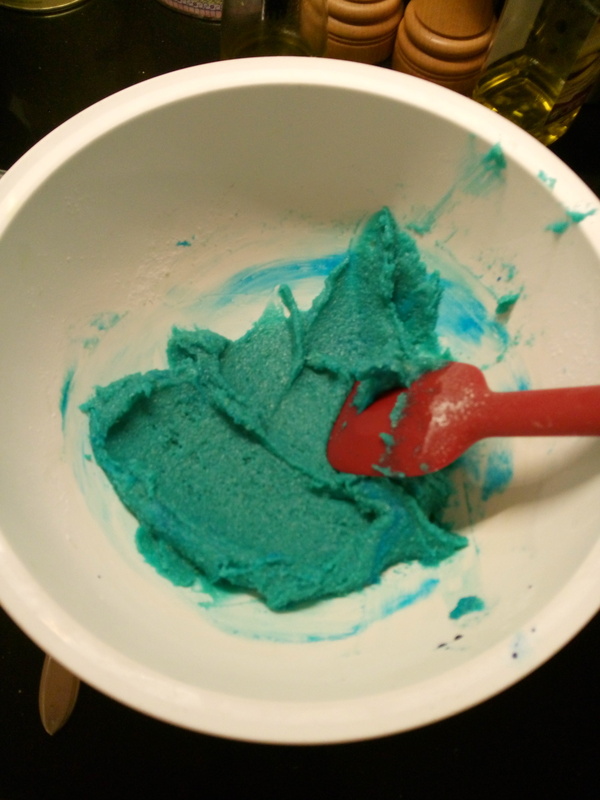 The blue ones did weird things: you can see the ‘feet’, but they came out unevenly. It’ll have to do. The blue ones will be vanilla flavoured. The exact time and temperature depends on your oven — you’ll need to experiment a bit. 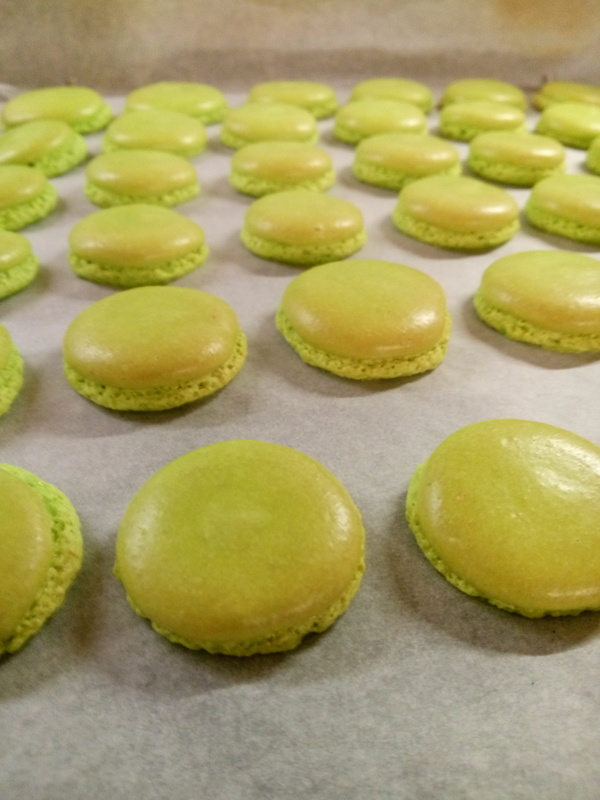 Next batch will be green, for green tea macarons. They came out better than the blue ones. 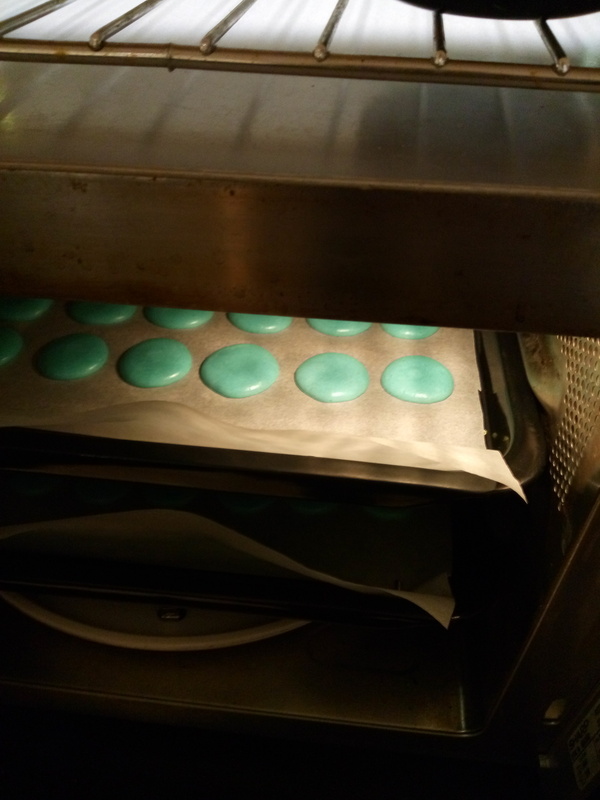 Our oven doesn’t heat up completely evenly, so some of the shells have brown edges — that’s not supposed to happen with macaron shells, but I can’t do any better with our equipment. And would I want to invest hundreds of euros for a professional oven? Nah. Just make sure that the shells are completely cooled down before peeling them off the paper. 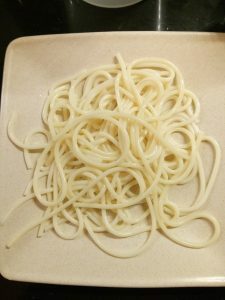 The outside should be smooth (not crunchy) and the inside a bit chewy. 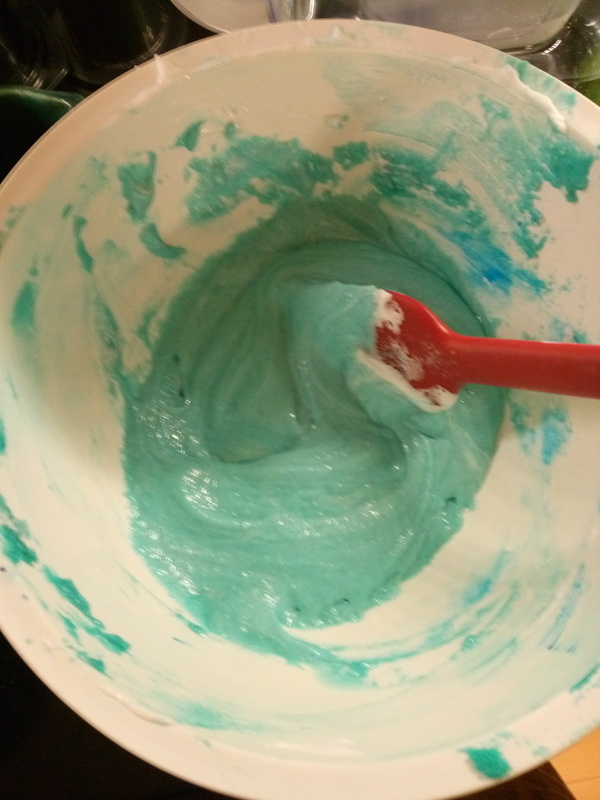 Next up: buttercream. Make another batch of the cooked meringue, switch to the flat beater, and then add 165 gr of butter to it. The heat of the meringue will melt the butter, but take care that the mixture doesn’t separate. This is also the time to add your flavouring. Some bakers use artificial flavourings, but I prefer naturals. So for the vanilla I used vanilla extract, and I used (food-grade) matcha powder for the green tea flavoured macarons. When it’s all done, put it in a piping bag and fill the shells. Seek out two shells of roughly the same size and pipe some of the cream on top of one, and place the second shell on top of that. Put the finished macarons in the fridge to let the cream firm up. The finished result! As always, they were a huge success. The vanilla ones more so than the green tea — though I actually preferred the green tea, because the bitterness of the matcha really complements the sweetness of the shells and buttercream. And with the release now done, I should have lower stress levels too, which is a nice added bonus. When in Japan, one of my favourite things to eat is the tonkatsu: a fried breaded pork cutlet. 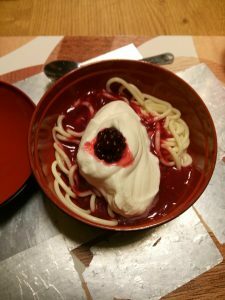 On it’s own, it’s quite tasty: we’ve eaten quite a few times in the KYK tonkatsu restaurant at Kyoto station. They serve the tonkatsu with miso soup, rice and cabbage — and you can get free refills of those three too. But it also makes a perfect set-piece for a more complex meal, like the katsudon (tonkatsu gratinated with an egg on top of rice) or katsu-curry (tonkatsu with rice and the Japanese-style curry) — all very tasty! Last time we were in Japan, we had lunch at a tonkatsu place. 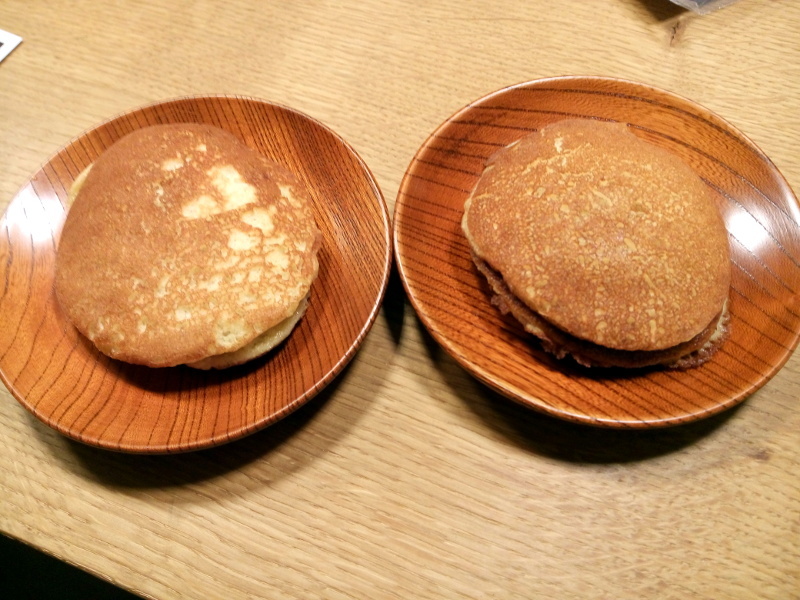 Their speciality was miso katsu: a tonkatsu with a special miso sauce. I really like the taste of miso, so I took a chance. It was amazingly good! The rich miso taste really complements the taste of the tonkatsu very nicely, and I was an instant fan. So when we were making our menu, I looked up a recipe for miso katsu, and I found one — and it’s quite simple, and we had everything needed in our cupboards! 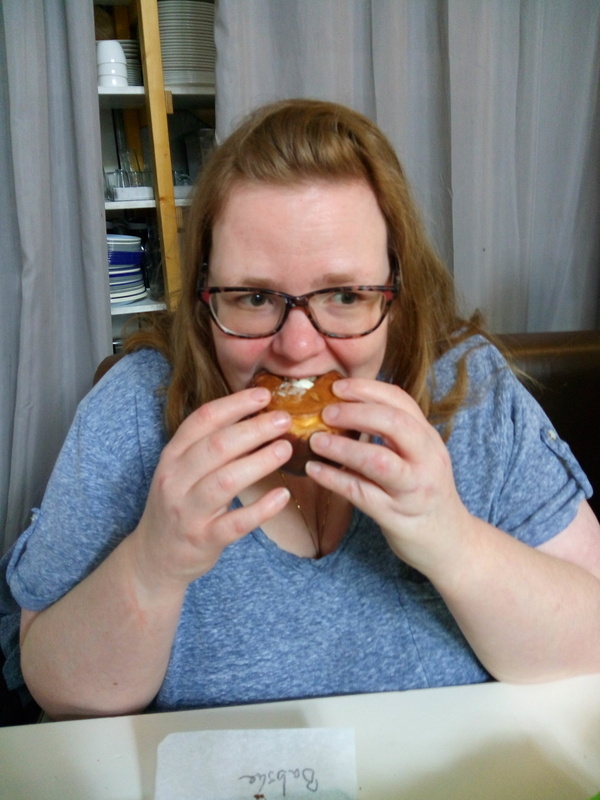 We did ‘cheat’ and got a wiener schnitzel instead of making our own tonkatsu. 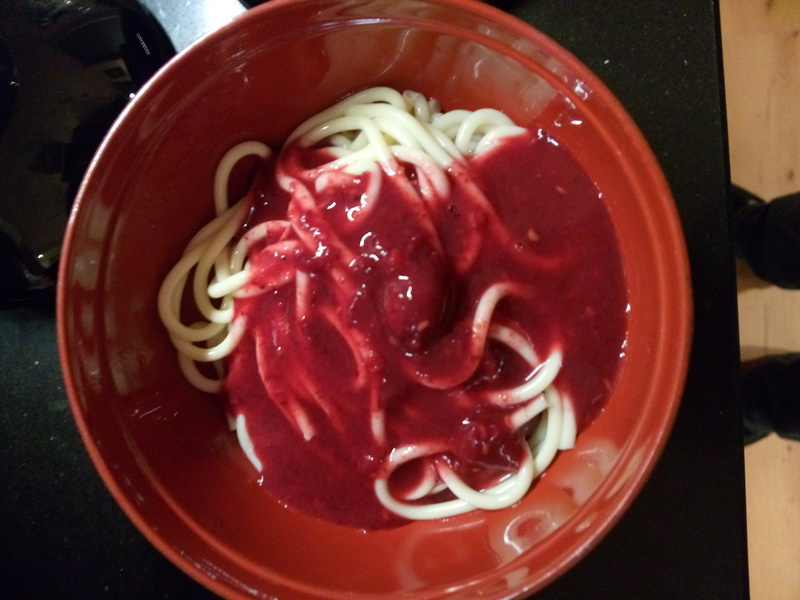 We used white miso the first time, but for the second time I used red miso, and the taste was even better! 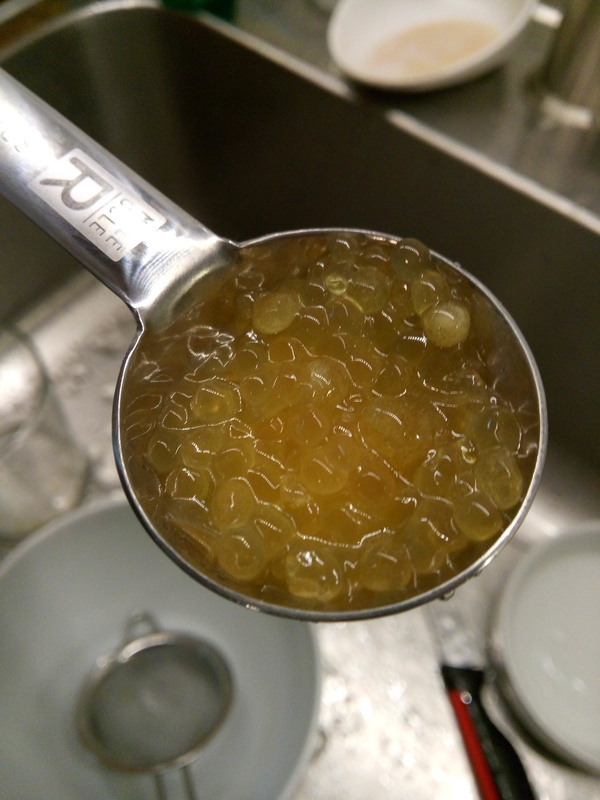 It’s quite salty though, because of the dashi stock that has to be reduced. Maybe if we make a larger batch, we can reduce the amount of dashi. 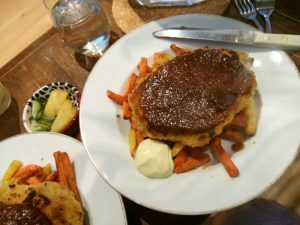 The miso sauce is spread all over the schnitzel, and it was amazing! We ate it with vegetable fries (carrot and parsnip) and pickles (daikon and cucumber). Definitely something we’ll be eating more often! 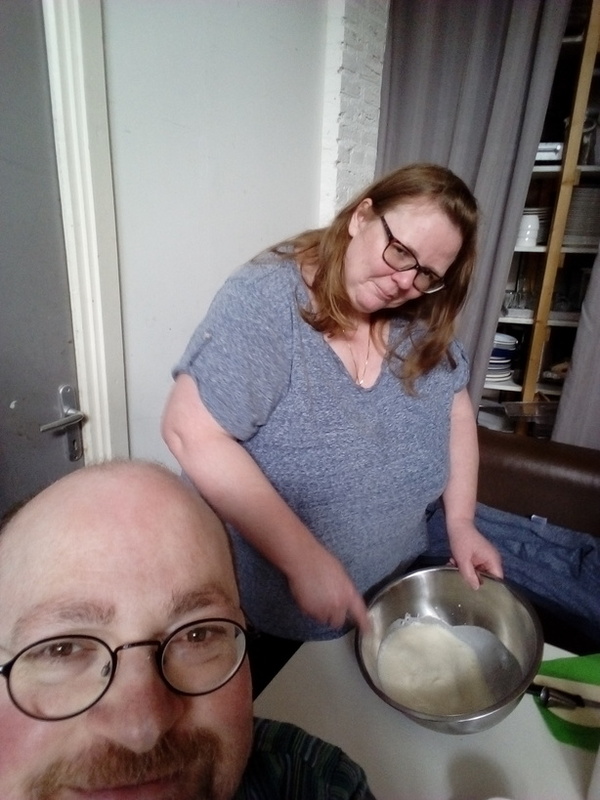 Last Monday, I had a day off — originally to be on stand-by in case an update on the webserver for klik‘s work would go wrong. But that had happened on the Wednesday before (and went off without a hitch). But I had already requested (and gotten) the day off, so I decided to let it stand. Only afterwards did we realise that we would be married exactly 12.5 years on that day! So we had every reason to spend the day together and do something pleasant. In the afternoon we went to see An, a sweet taste of life. 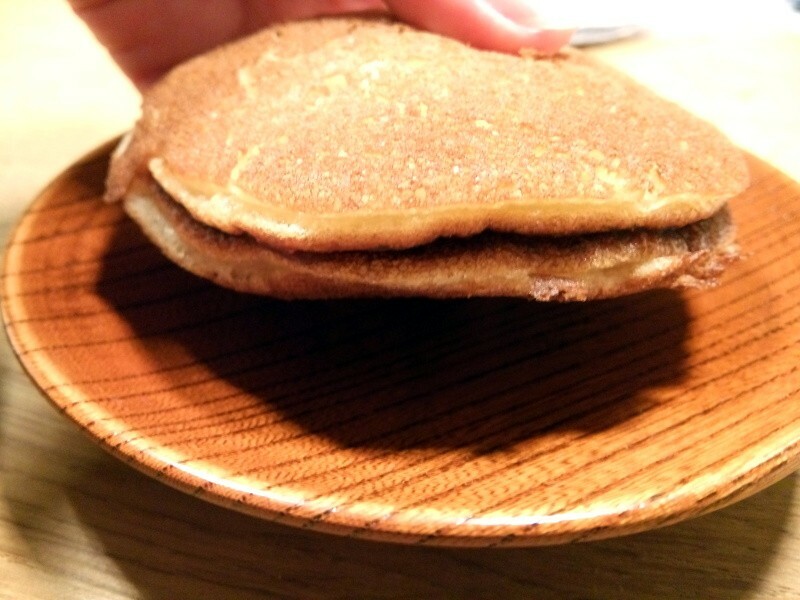 When we were getting the tickets, we noticed a little folder about the movie, and it had the recipe for the sweets that are made in the movie: dorayaki, fluffy pancakes with a filling of sweet bean paste (which is called ‘an’, the title of the movie). The movie itself is nice, I’m not going to spoil it! Then we walked around the city centre for a bit, stopped for a cup of tea, and then we went to restaurant Ivory. We had a wonderful dinner there — we’ll be sure to return! Of course, the recipe had to be tried out! We used store-bought an though (we’ve made it ourselves before, but it’s kinda finnicky). The end result was delicious! 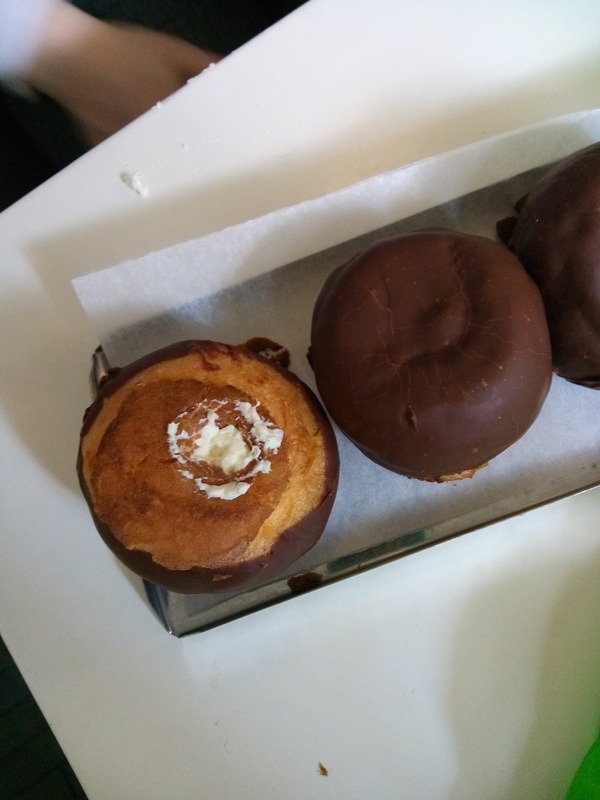 Klik had baked some for a gathering she had today, and there were two left which we had as dessert! There’s an apple farmer close to Nijmegen that allows people to come to the orchard and pick their own apples, every Saturday in September. We’ve been there before, and we thought it would be fun to go again. babarage and her husband came along! Apples! 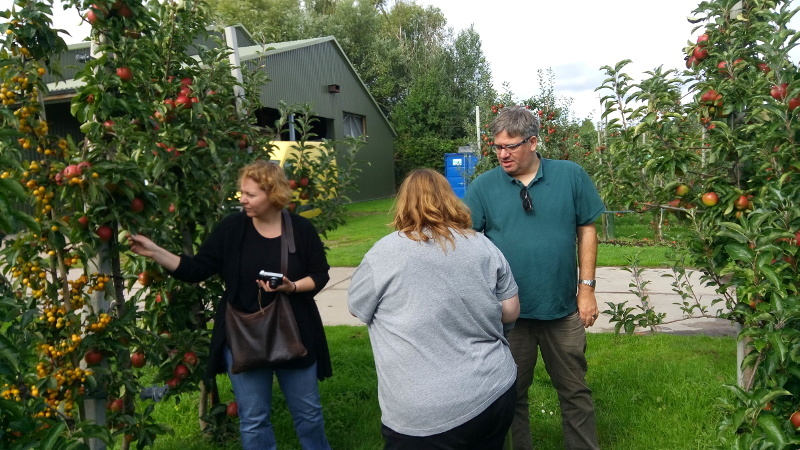 We got some instructions on how to pick, and were advised to pick the biggest and reddest apples. 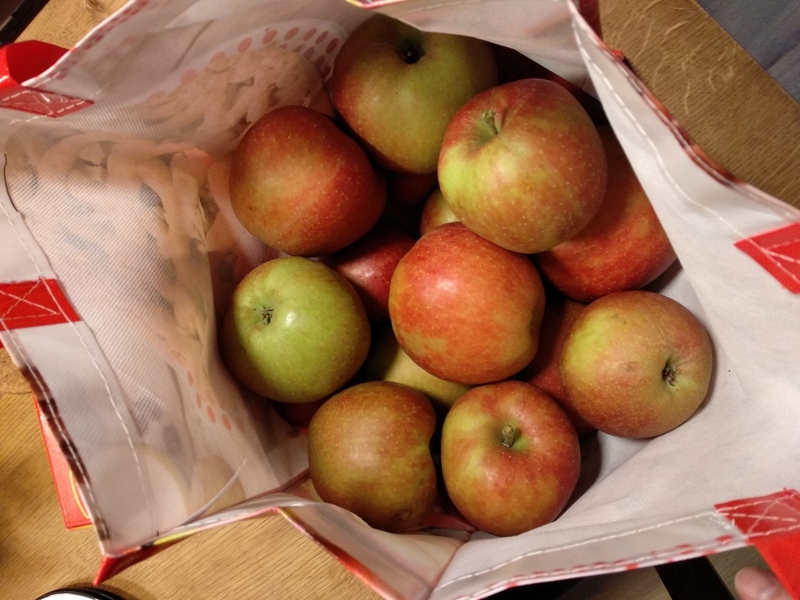 Selecting the best ones to make into apple pie. That tree with the little orange fruit (which is inedible) is there to attract bees and wasps for pollination, because the flowers smell much stronger than the flowers of the apple trees. 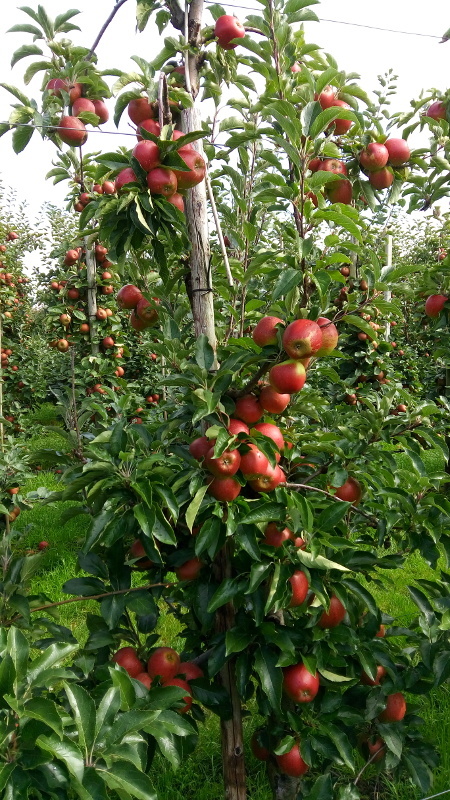 Every tenth tree in the orchard is one of those ‘attractor trees’. 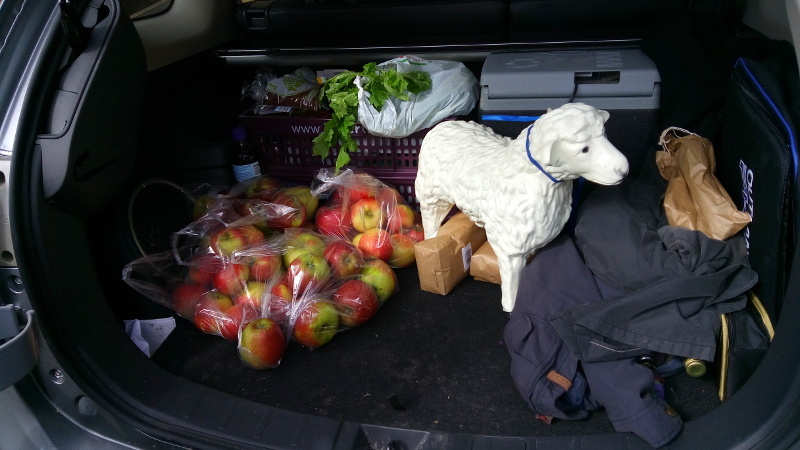 Our haul: eleven kilos of apples — a mix of goudrenet and elstar. 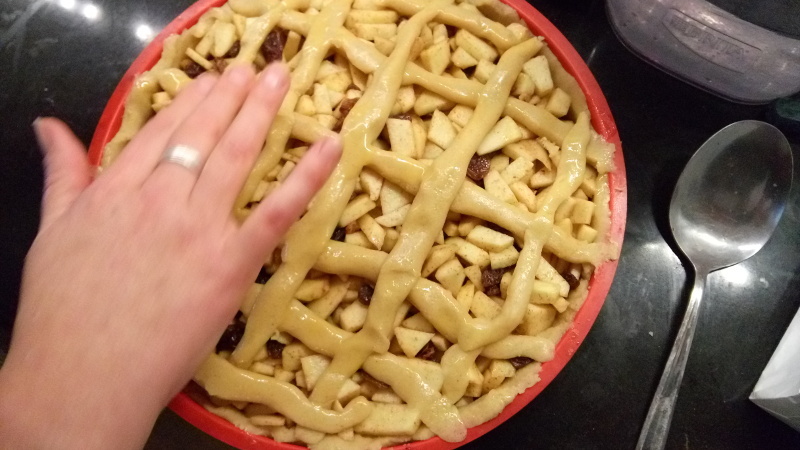 Each pie would take about a kilo of apples, so we overshot our target by quite a bit! Cutting up the apples. They were so fresh that they didn’t even get brown after being peeled for some time. klik putting the finishing touches on the finished pie. We added more raisins than the recipe called for, because we could. One hour later: fresh out of the oven! 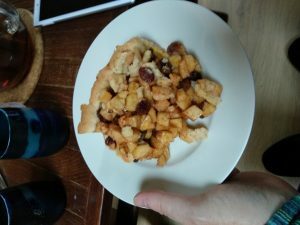 Cutting up the pie made a bit of a mess — no beautiful portions but more of a ‘freestyle’ piece of pie. Perhaps this is due to the extra moisture from the elstar apples. One day later, the bottom of the pie has gotten a bit soggy as well. One of the tips we got was to use baker’s cream powder on the bottom to absorb the excess moisture, which we might try on a following pie. 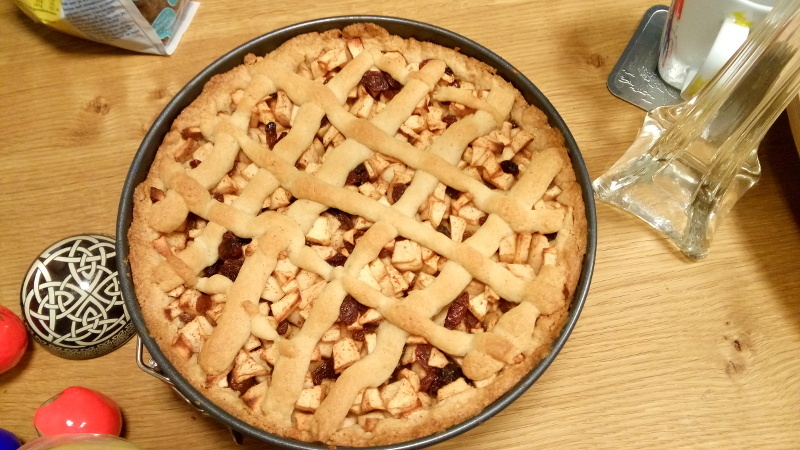 We also baked a second pie for babarage to take home. 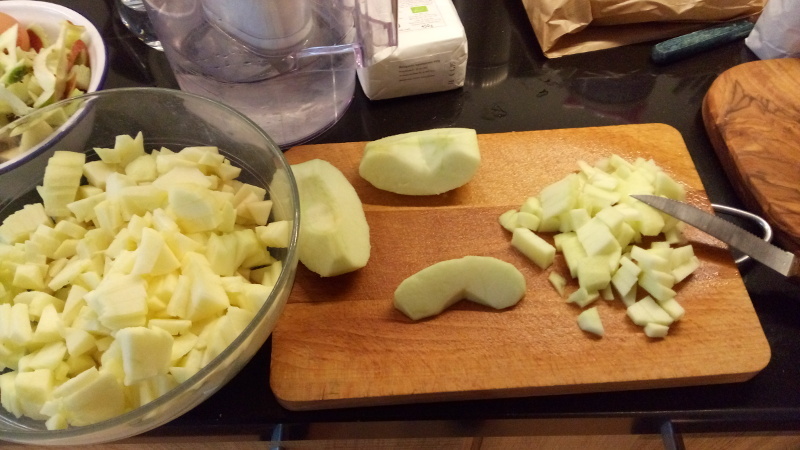 To supplement dinner, we also cut up some apples and warmed that up in the microwave. Smash it up with a fork (as fine as you wish, I prefer a bit chunky), and add a bit of cinnamon. 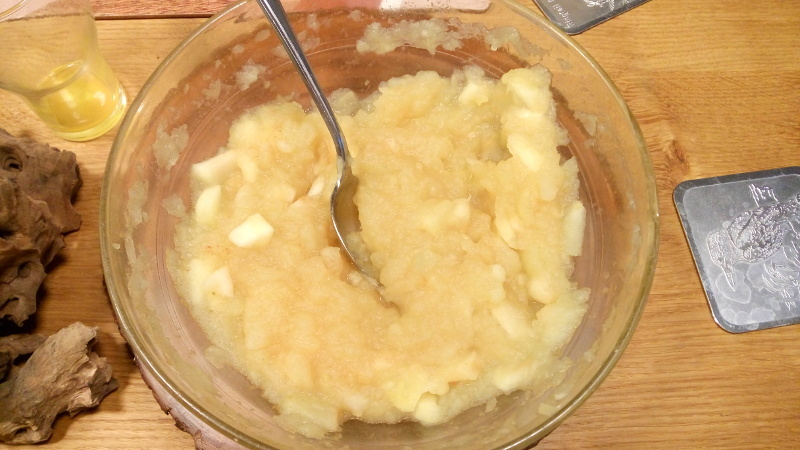 Almost-instant applesauce, doesn’t even need added sugar! One of the cool things of having a semi-professional mixer, is that beating egg whites into a stiff mass is not really a problem: just pop ’em in the bowl, set the Kitchenaid on maximum, and within two minutes it’s done. 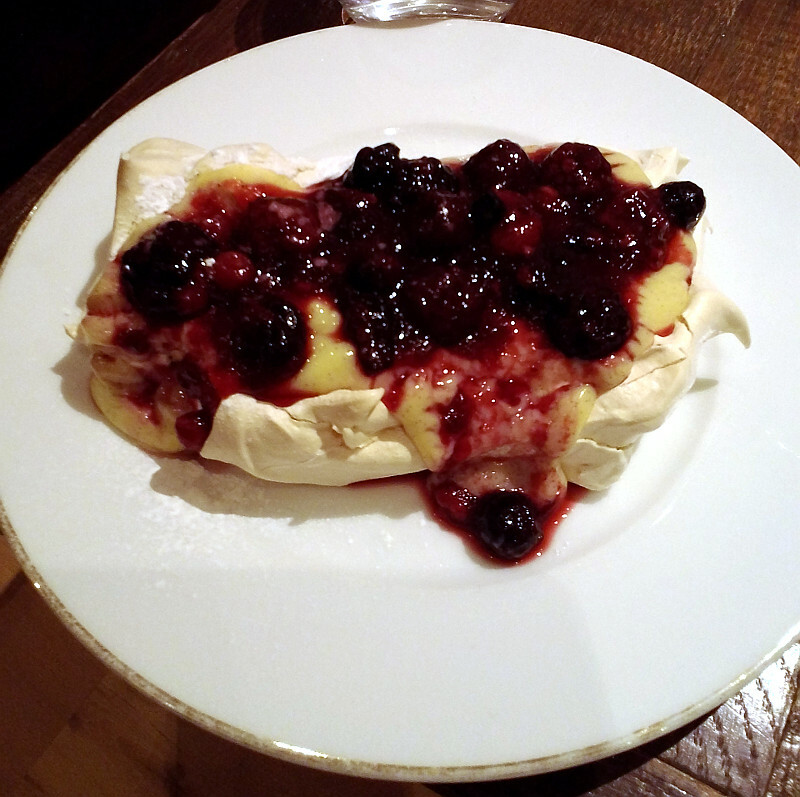 pavlova! 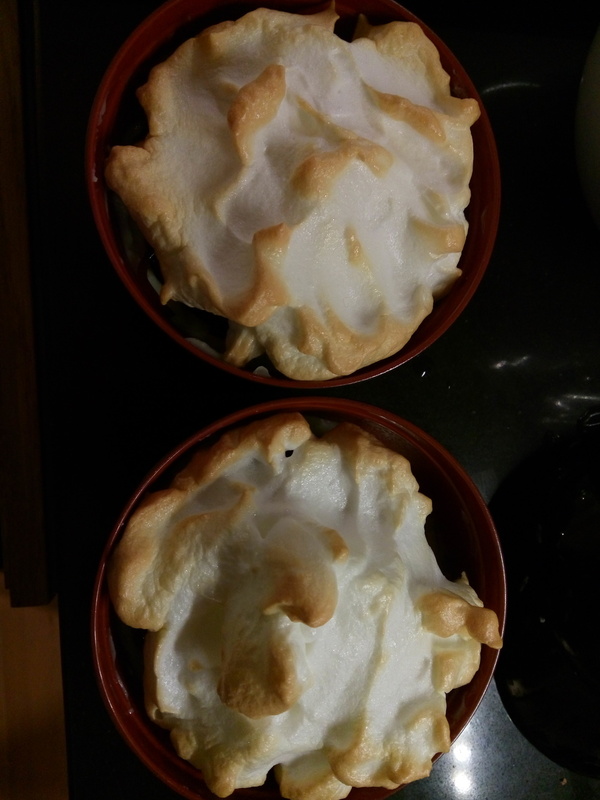 But instead of whipped cream, we used pattisier cream (using egg yolks and vanilla). 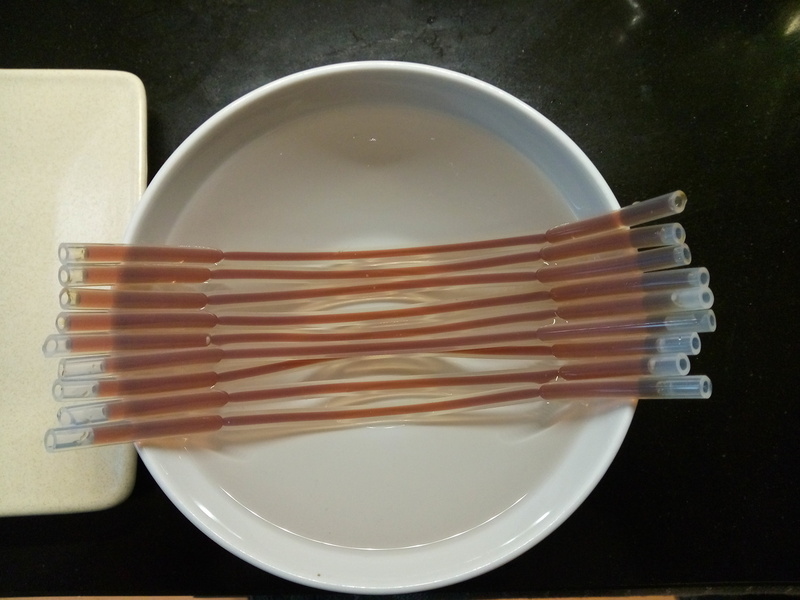 The fruit filling was cooked up with a bit of agar and lemon juice. It was so deliciously soft on the inside, with a lovely ‘crunch’ on the outside. 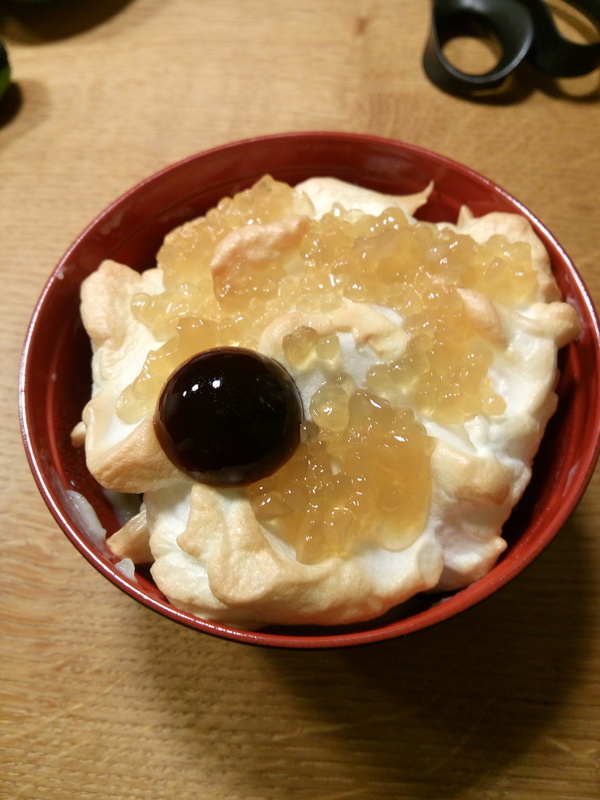 The rich cream and the sweetness of the fruit really complemented it. 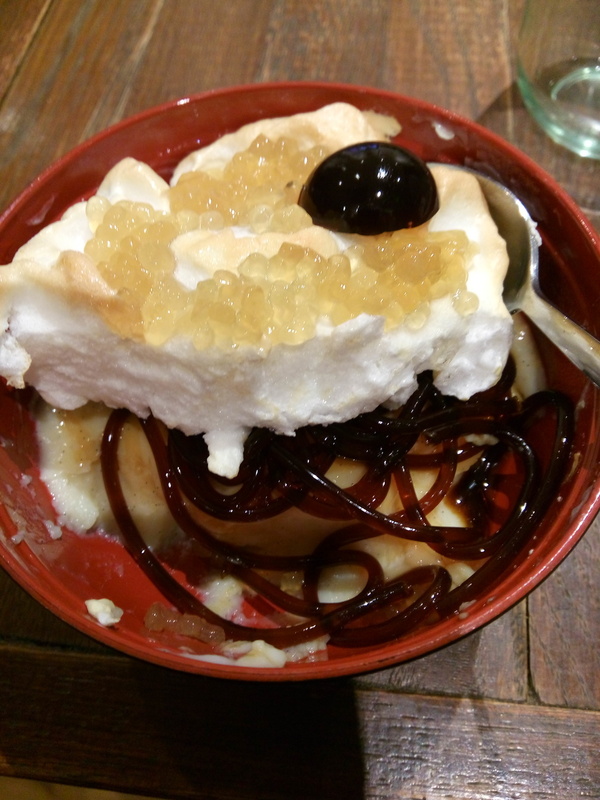 I think this is a dessert we can serve with pride!